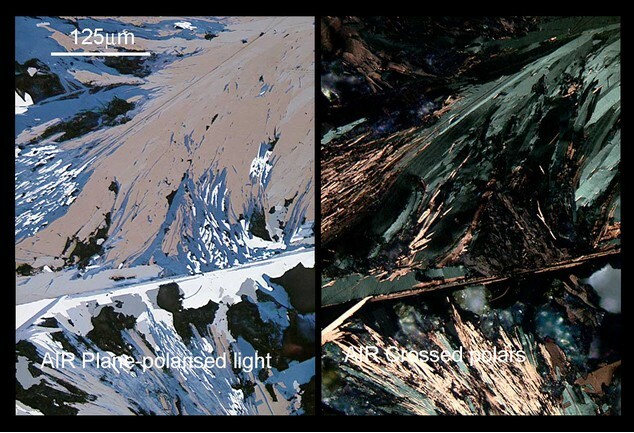 Nukundamite: Mineral information, data and localities. Cu3.37Fe0.66S3.97 (type material); Cu3.39Fe0.61S4 (synthetic material). Nukundamite is stable within a highly limited range of a(Fe2+)/a(H+) activity ratio, S2 and O2 fugacities, at temperatures between 501° and 224°C at very high sulfidation states (Seal et al., 2001; Esra Inan and Einaudi, 2002). It may be replaced by chalcopyrite and bornite. 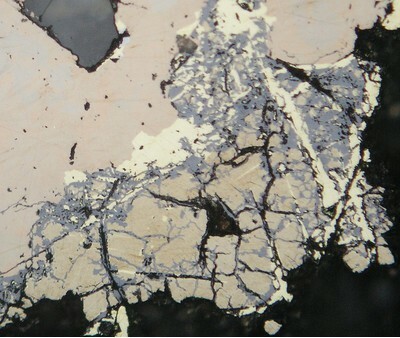 One of the Cu-Fe sulfides that has been referred to as the grandfathered but inadequately described idaite; type locality nukundamite was first called "idaite" (cf. Rice et al., 1979). Museum of Natural History, Washington, D.C., USA, 148128. Kuroko-type ore deposit. 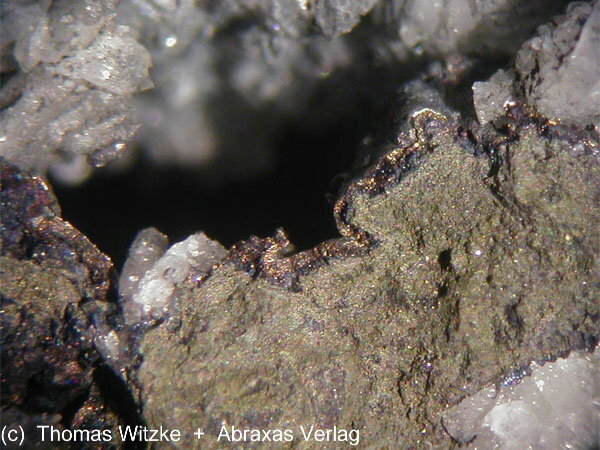 Cavity fills in pyrite breccia,alteration of chalcopyrite, lamellae in sphalerite. Pyrite 4 photos of Nukundamite associated with Pyrite on mindat.org. Stannoidite 4 photos of Nukundamite associated with Stannoidite on mindat.org. Mawsonite 4 photos of Nukundamite associated with Mawsonite on mindat.org. Chalcopyrite 4 photos of Nukundamite associated with Chalcopyrite on mindat.org. Hematite 4 photos of Nukundamite associated with Hematite on mindat.org. Covellite 3 photos of Nukundamite associated with Covellite on mindat.org. Clausthalite 2 photos of Nukundamite associated with Clausthalite on mindat.org. Idaite 1 photo of Nukundamite associated with Idaite on mindat.org. Rice, C. M., Atkin, D., Bowles, J. F. W. and Criddle, A. J. (1979): Nukundamite, a new mineral, and idaite. Mineralogical Magazine 43, 193-200. American Mineralogist (1980): 65: 407. Sugaki, A., H. Shima, A. Kitakaze, and T. Mizota (1981) Hydrothermal synthesis of nukundamite and its crystal structure. Amer. Mineral., 66, 398–402. Seal, R. R., Inan, E. E. & Hemingway, B. S. (2001) The Gibbs free energy of nukundamite (Cu3.38Fe0.62S4): a correction and implications for phase equilbria. Canadian Mineralogist 39, 1635-1640. Esra Inan, E. and Einaudi, M. T. (2002): Nukundamite (Cu3.38Fe0.62S4)-bearing copper ore in the Bingham porphyry deposit, Utah: Result of upflow through quartzite. Economic Geology, 97, 499-515. M. Lupulescu, E. B. Watson, D.Wark (1993) Unusual nukundamite occurrence in an iron deposit from Romania and its metallogenetic implications -"Current Research in Geology Applied to Ore Deposits", Eds.Fenoll Hach-Ali, Torres-Ruiz & Gervilla, Granada, Spain. p. 155-158. Esra Inan, E. and Einaudi, M. T. (2002): Nukundamite (Cu3.38Fe0.62S4)-bearing copper ore in the Bingham porphyry deposit, Utah: Result of upflow through quartzite. Economic Geology, 97, 499-515.; North, Jerry (2010) Displays of Nature : History, Minerals & Crystals of Utah's Bingham Canyon Copper Mine.